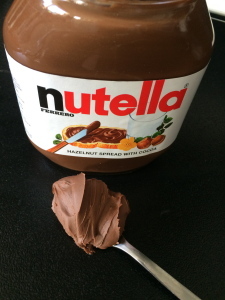 How can you look at the title of this post and not be desperate to eat some Nutella immediately? 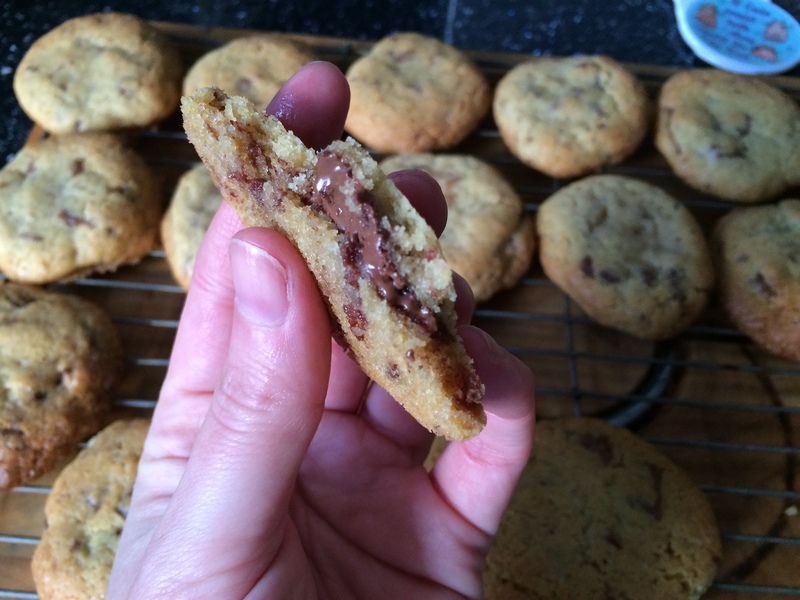 And look at that picture of gooey Nutella stuffed into a warm chocolate chop cookie! Yum! I got the idea for stuffing cookies with Nutella when I saw a collection of ‘seasonal cookies you must try’ on Buzzfeed: one of the recipes was for a chocolate cookie filled with Nutella, and the photograph of the soft Nutella peeping out of the broken cookie was enough to convince me it was something I had to try. However, that recipe, and all the others I found from searching online, used American cup measurements. I always avoid recipes which use cup measurements, as I cannot be bothered to convert them into metric. 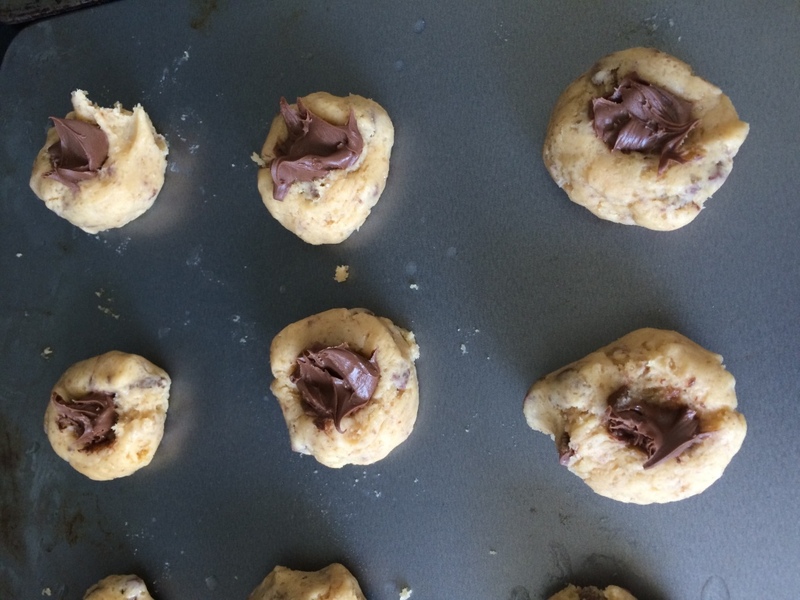 The principle for each recipe was the same though: refrigerate or freeze the Nutella and place a ball of it into the centre of a piece of cookie dough, and bake in the oven. I decided I would be able to use my own chocolate chip cookie dough, reducing the amount of chocolate chips in it so there would be enough dough to wrap around the Nutella. I put the jar of Nutella in the fridge for 12 hours so that it would solidify, but couldn’t be bothered to freeze scoops of it (nor did I have the space in the freezer to do so). 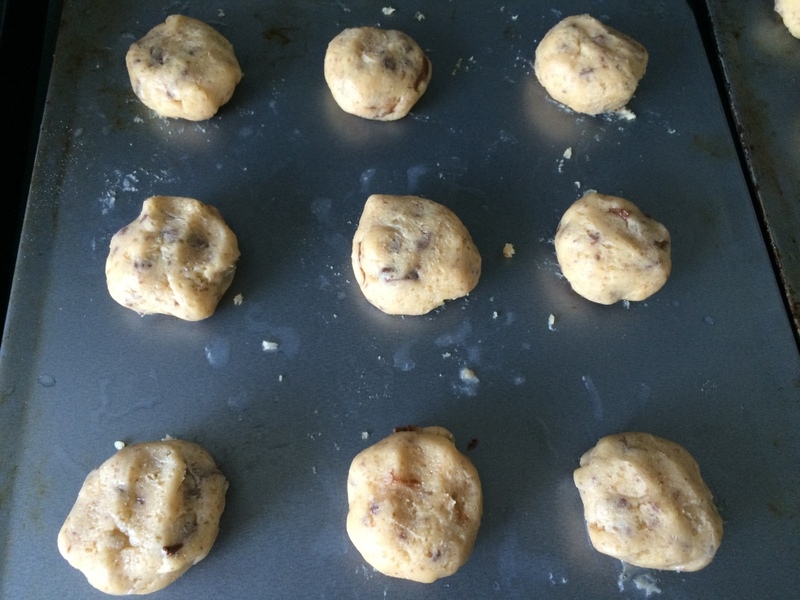 My cookie dough takes minutes to make, especially if you have a KitchenAid to mix the ingredients. I chopped an 80g bar of chocolate to make the chocolate chips (my previous recipe uses a 200g bar) and then portioned out the mixture into 18 balls. I made a hole in each ball to take the Nutella (no bigger than the size of a Malteser), and then wet my hands and shaped the dough around the ball of Nutella – it’s essential to wet your hands, as the dough won’t stick to them and will be easy to work with. Cream together the butter and sugars and then add the vanilla and egg, followed by the flour, bicarb and salt. When combined, stir in the chocolate chips (I chopped up a bar of milk chocolate). Use a teaspoon to put 18 equally sized dollops of the mixture onto an un-greased baking tray. With wet hands, roll each into a ball, and make a dip in each one with your finger to put the Nutella in. Scoop a malteser sized amount of Nutella into each cookie, and then with wet hands again, shape the dough around the Nutella. 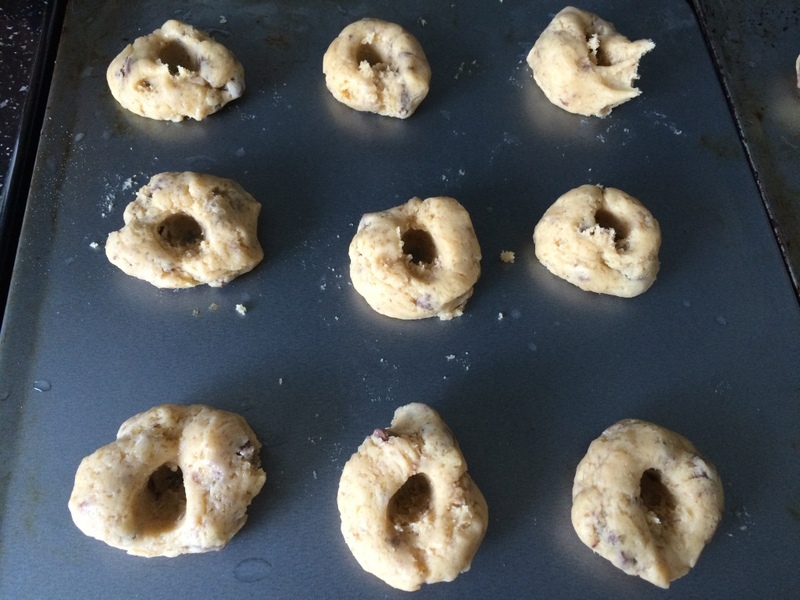 The cookies then need to be baked for 8-10 minutes at 170 degrees, so they start to brown at the edges. 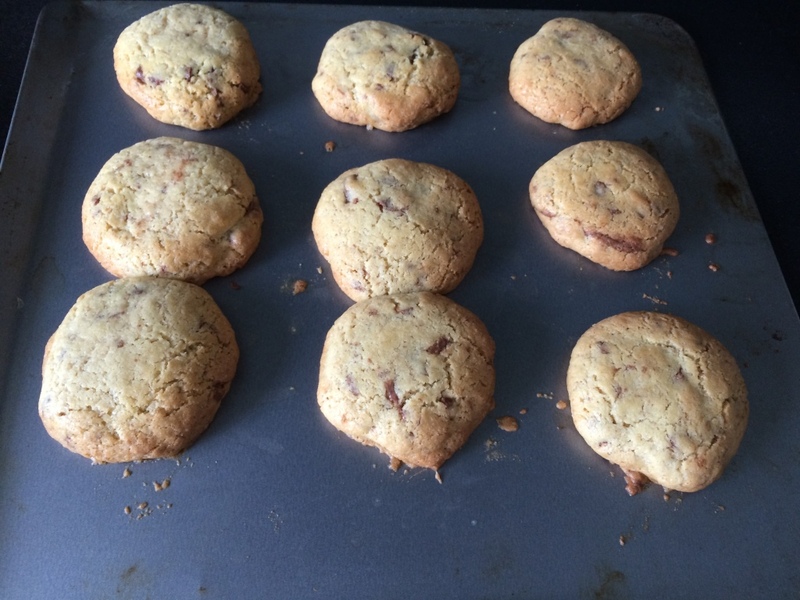 The cookies will still be soft when you take them out of the oven, so leave them on a baking tray for a couple of minutes until they are a bit harder, then remove to a cooling rack. It’s really hard to resist cracking one of them open immediately to check out the Nutella, but do wait as the filling will be molten! I made these as a gift for our friends Jo and Billy – it nearly broke my heart to give them away, but I did treat myself to one so that I could photograph the inside for the blog. Absolutely not because I was being greedy and couldn’t resist inhaling one! 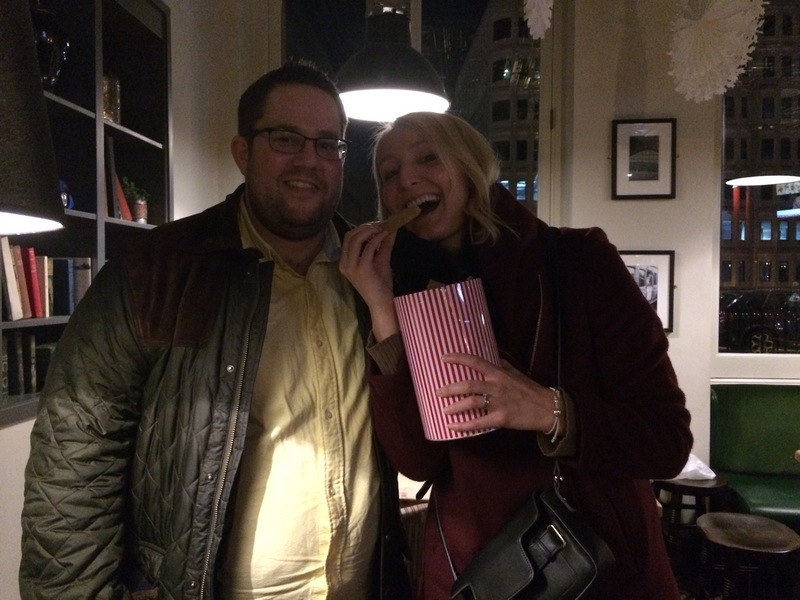 As you can see from the picture below, Jo couldn’t resist eating one either! i am making chocolate chip netella cookies for mays party. I hope they are delicious!